Description: Fruiting body 5 to 60 cm broad, up to 4 cm thick, fan-shaped to obtusely semicircular, smooth to gently wrinkled, suedelike, bright yellow to bright orange when young, fading in maturity and with direct sunlight; flesh at first succulent and exuding yellowish drops, but white and crumbly with age; taste pleasant and slightly sourish; smell strong and fungusy; pores small, sulfur-yellow; spores white. Habitat: Grows on coniferous stumps and downed logs, late summer to early fall. 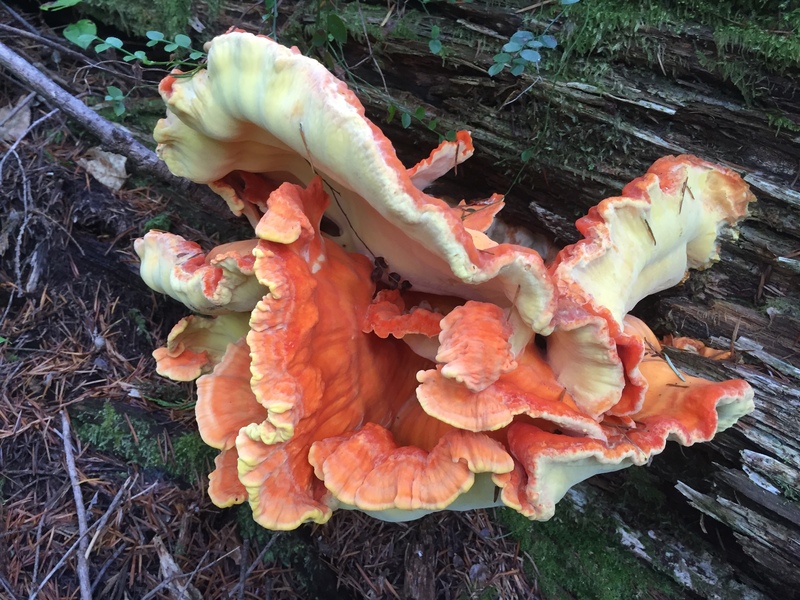 Primary Keys: Shelves, bright orange surface, sulfur yellow underside, growing on coniferous stumps and logs. Edibility: Very good when young. Only very young shelves, or the outer edges of slightly older specimens, should be harvested. Notes: This easily identified species was formerly L. sulphureus, but our western species grows only on a coniferous substrate west of the Rockies. It will fruit annually on the same log for many years and is an early harbinger of the mushroom season. It is an easily spotted species, sometimes visible from hundreds of feet away in the woods. Crunch up the ramen noodles and combine with the cabbage, carrots, green onions and water chestnuts. Whisk together the dressing and pour over the salad ingredients. Refrigerate 12-24 hours, tossing several times. Just before serving, top with sauteed Laetiporus conifericola slices, almonds, and cilantro.